Following my July 15, 2018 article titled "Finesse Fishing for Fingerlings," several of you asked me to do a report on fly lines in general. Specifically, you had asked that I recommend fly lines ranging from inexpensive to expensive and the differences between them. That's a tall order because inexpensive doesn't necessarily jive with quality. However, in the case of KastKing fly lines, I can fill that request by addressing KastKing products in general via their own catchwords: Affordable Innovation. And that's what KastKing is all about. Addressing quality, especially with regard to the company's higher-end products, both excellence and value go hand in hand at a very affordable price. We'll begin with KastKing Propel Floating Fly Line for freshwater angling. Propel Floating Fly Lines presently come in line weights ranging from WF-3-F to WF-8-F, available in three different colors: Evergreen, Salmon, and Yellow. The designation of a WF-6-F fly line translates to Weight Forward-#6-Floating. These fly lines present many of the features found in expensive, high-performance fly lines, such as high-flotation properties, high-end component materials, and silky-smooth surface coatings. As far as virtual coil-, tangle-, and memory-free company claims are concerned, KastKing lines hold their own by comparison to other brands. However, keep this fact in mind: The longer you keep a fly line on the reel's spool, the more it's going to retain its memory. However, it's really a simple matter of running several yards of line through a damp rag just before making your first cast in order to rid the line of memory. I know folks who go through all sorts of antics to eliminate line memory. One method is to stretch the fly line around the ball of their trailer hitch, or around the extended arm of a roof rack. That's a sure way to mar the smoothly finished surface of your fly line. The damp rag approach is a simple solution. You should always have a rag handy anyhow. Also, you could pay out the fly line in a swift moving current to uncurl those memory coils. 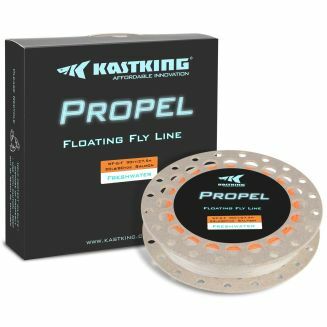 Interestingly, KastKing Propel Floating fly lines are designed to be a half weight heavier than labeled in order to help improve turnover as well as to increase casting distance. Some anglers prefer to keep their outfit(s) balanced; for example, employing a 6-weight rod with a 6-weight fly line. Other anglers prefer to go up one size in line weight; that is, utilizing a 7-weight fly line in conjunction with a 6-weight rod. I found this heavier half-size increment rather intriguing. It's a nice compromise between the extra oomph sometimes needed to properly load the rod in the hands of a newbie as well as those who insist on a one-size heavier line weight for a number of reasons. Namely, as mentioned, the benefits of turnover and greater casting distance. KastKing Propel Floating Fly Lines come spooled with 50â€“100 yards of 20- or 30-pound test white braided Dacron backing that is already attached to 90 feet of fly line. The line features a welded front loop, which, of course, facilitates leader connection. KastKing's Propel fly lines are constructed with a unique belly design, a short front taper, and a long running line. The overall design of a fly line is the key to its performance. A fly line's construction takes into account its thickness, thinness and consequent heaviness and lightness. For example, a Propel 6-weight is broken down from back to front as follows: 50Â½ foot running line, 13 foot rear taper, 19Â½ foot belly, 6Â½ foot front taper, Â½ foot tip (inclusive of a welded font loop). It is a fine freshwater floating fly line for the money ~ $21.98. 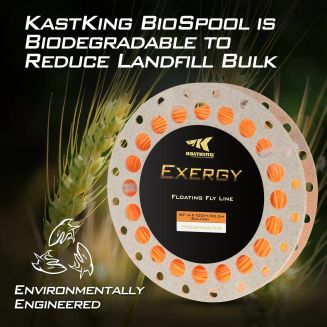 Taking it to the next level with quality and value in mind, KastKing offers their Exergy Floating Fly Line for fresh water. Forgoing the braided Dacron backing found on the KastKing Propel brand, this 100-foot fly line has two welded micro loops at each end, which facilitates attaching both backing and leaders. Additionally, the tip of the Exergy line is laser printed with its line weight. The line fly line is 10 feet longer than the Propel brand. Presently, Exergy line-weight sizes range between WF-3-F through WF-F. An example of a 100-foot Exergy WF-#6-F is broken down from back to front as follows: 60Â½ foot running line, 13 foot rear taper, 19Â½ foot belly, 6Â½ foot front taper, Â½ foot tip (inclusive of welded loop). The noticeable difference between the two fly lines is that the Exergy fly line is super slick, which glides through the rod's snake guides with considerable ease. This, of course, translates into longer casts and offers greater line control. Exergy flylines offer the following colors: Aqua, Evergreen, Salmon, Sky, and Yellow. It is an exceptional freshwater floating fly line for the money ~ $29.98. Compare KastKing fly lines to fly lines costing three, four, and even five times the amount and you will realize that you are on the brink of a great bargain. How does KastKing manage to do it? Simple. They are an eCommerse company, which translates into considerably low overhead, Internet technology versus brick-and mortar-buildings, fat salaries, et cetera. These are not cheap lines that you spool onto a kid's first fly-fishing outfit, nor are they merely backup fly lines that one has on hand in a pinch. KastKing fly lines are super, great affordable fly lines. Supple and slick as a whistle. Just think how nice it would be to run the full spectrum, having a good many fly lines on hand to fill an assortment of fly angling applications. Now you can. Bull's Eye! 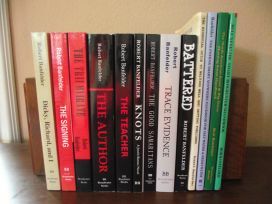 The Smart Bowhunter's Handbook ~ Sage Advice on Crossbows, Compound Bows, Broadheads, Targets, Clothing & Gear ~ Bonus Feature: Bowfishing on a Budget. A must-have guide for both novice and veteran bowhunters.